For over a decade our company is proud to be the sole source of FERRETONIN and DERMATONIN injectable melatonin implants. Over time our implants release 100% natural melatonin consistently over a 180-day period, stimulating the regrowth of hair and fighting the effects of adrenal disease in ferrets and atypical Cushings Alopecia-X in dogs and cats, and other animals. And, because it's implanted just below the hair line with no trauma to the animal, it eliminates the need for twice daily dosing of other forms of melatonin and also provides a consistent level of melatonin for maximum effectiveness. For over 30 years melatonin implants have been used in the treatment of millions of fur-bearing animals including ferrets, dogs, cats, skunks, mink, fox, raccoons, rabbits, sheep, elk, cattle as well as large animals. 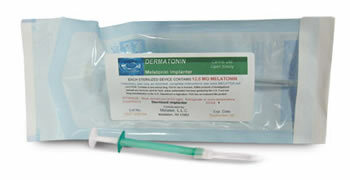 The original function of the melatonin implant was to stimulate the furring process. Additionally, research by caring veterinarians that work with ferrets have determined that the melatonin implant also provides an effective treatment for adrenal disease by both fighting the adverse effects of the disease as well as stimulating new hair growth. The product arrives as a sterilized, pre-loaded, single dose (disposable) syringe. The procedure / process to administer is similar to a microchip implant, which is approximately the size of a grain of rice and is administered by a veterinarian according to instructions.